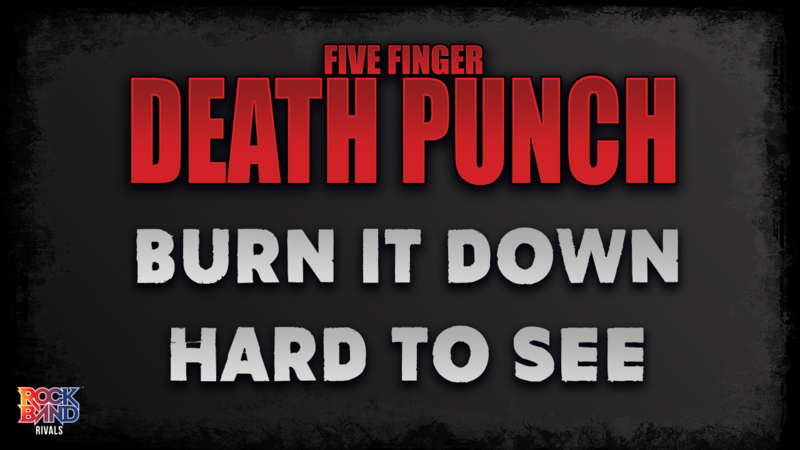 Just in time for their tour, were adding some great Five Finger Death Punch tracks to Rock Band 4! Burn It Down starts the week off, a fan-favorite track off of War Is the Answer, Five Finger Death Punchs second album. Keeping their momentum going, the album had a strong debut and was certified platinum with over a million US sales. Burn It Down is a live staple, being one of the bands most frequently played songs while touring, and makes for a tough track in Rock Band. The guitars verse riff is a HOPO line that the bass matches, with quick strumming opening the choruses. The drums play a bunch of double-kicks, testing your heel-toe technique. Were also bringing Hard to See to Rock Band 4 this week. Hard to See was the first single from War Is the Answer and is one of their strongest singles to date. It was the bands third top 10 on the Hot Mainstream Rock Tracks chart and also marked their first foray onto Billboards Hot Rock Songs chart. Drummers will have busy feet, with dense bass pedal through nearly the whole song. Youll have to hold that cadence while hitting the fills, creating a great challenge for those developing their limb independence. Guitarists should watch out for the solo, where things are cranked up a notch and youll have to manage a stream of HOPOs across all colors. And if this isnt enough for you, be sure to head over to Five Finger Death Punch's website to check out the new album AND JUSTICE FOR NONE and their impending US tour! Two of the biggest artists in rock, Five Finger Death Punch and Breaking Benjamin, are joining forces for a massive summer co-headline tour. The 32-stop tour, which kicks off on July 16th in Seattle, WA, runs through September 9th and hits amphitheaters in every major market. Fans purchasing a ticket to the tour will also support a good cause. The co-headliners will donate $0.50 from each ticket sold to two charity organizations close to their hearts. Five Finger Death Punch has chosen C.O.P.S - Concerns Of Police Survivors, an organization whose mission is rebuilding shattered lives of survivors and co-workers affected by line of duty deaths, through partnerships with law enforcement and the community. Breaking Benjamin has chosen Prevent Child Abuse America to help counteract the abuse and neglect of our nations children by promoting services that improve child well-being and developing programs that help to prevent all types of abuse and neglect.